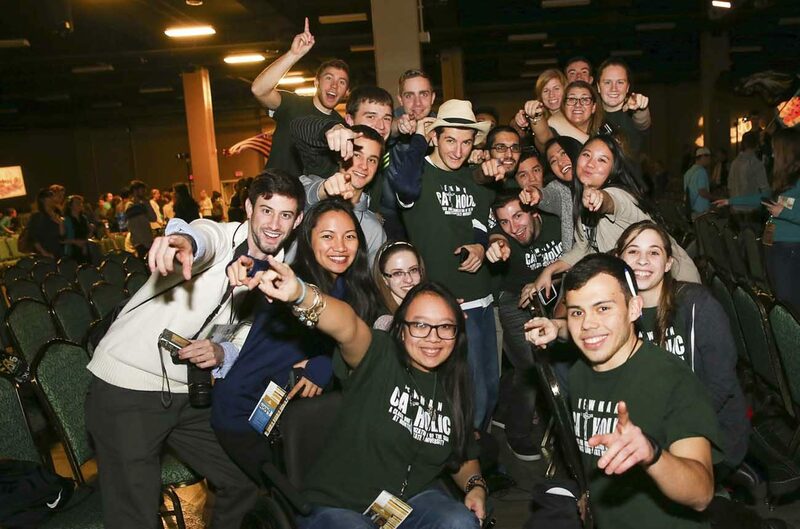 WASHINGTON (CNS) — In a couple of short weeks, more than 12,500 people, mostly college students, planned to descend on San Antonio for the Jan. 3-7 SEEK2017 conference of the Fellowship of Catholic University Students. The sight of so many college-age young people gathered to grow in their faith relationship with Christ and the Catholic Church is awe-inspiring, said Capuchin Franciscan Father John Lager, national chaplain for FOCUS since 2013. The priest is often brought to tears to see so many young people “on their knees in great prayer,” he told Catholic News Service in a telephone interview from FOCUS headquarters west of Denver in Genesee, Colorado. The biennial SEEK conference includes general sessions with keynote speakers, breakout sessions, liturgies, daily adoration, confessions and entertainment. About 25 bishops — including Archbishop Charles Chaput — will be in and out of the gathering; and over 200 priests will be there, as will dozens of seminarians and religious sisters. At SEEK2015, priests heard more than 5,500 confessions. A national Catholic outreach program founded in 1998, FOCUS invites college students into a relationship with Christ and the church. It is designed to inspire and prepare them for a life of evangelization, discipleship and friendship in which they lead others to do the same. More than 550 full-time FOCUS missionaries are currently on 125 college campuses in 38 U.S. states this academic year. And in its first international expansion, FOCUS this year has missionaries in two pilot locations in Austria — Graz and Vienna. Working with Father Lager at the national level are three other FOCUS chaplains — Fathers Brendan Rolling, Jay Buhman and Doug Grandon. Each oversees a region of the country. FOCUS also has campus chaplains. FOCUS missionaries walk alongside young people, accompanying them “on this wonderful journey of faith — those are the things that really capture where our young men and women are,” Father Lager said. “We accompany them. You don’t do this by yourself. It’s all about what God does,” he said, adding FOCUS folks are collaborators with the Holy Spirit. Out of that accompaniment have come vocations. Of the more than 20,000 FOCUS alumni so far, 600 have chosen a vocation as a priest or religious sister. FOCUS is not a vocation ministry, Father Lager emphasized, but added that vocations are a byproduct of good Christian formation that FOCUS fosters. Young Catholic men and women “want to know God’s will and to live out his call for them faithfully, whether that be marriage, priesthood or religious life,” said Sister Maria Juan Anderson, who recently professed first vows as a member of the Religious Sisters of Mercy of Alma, Michigan. She served as a FOCUS missionary at North Dakota State University in Fargo from 2007 to 2010. She also was involved with the outreach as a student at Benedictine College in Atchison, Kansas. “Being able to talk and share life with religious women, and witness their joy during my time as a missionary helped me to discern my own vocation to religious life,” Sister Maria Juan told CNS in an email. “By helping young people to develop the habit of daily prayer, and fostering a rich participation in the sacramental life, FOCUS aids young people in coming to a place where they can encounter the love of Christ that enables one to hear the voice of the Father inviting them to a life given to him in their vocation,” she said. “The very mission of FOCUS — to know Jesus Christ and to fulfill his great commission — is the mission of every priest and religious man and woman. It is the call for every baptized Christian,” she added. Sister Therese Marie of the Visitation also is a former FOCUS missionary. She is a member of the Community of Franciscan Sisters of the Renewal. She, too, recently made her first vows. “In today’s culture, it’s becoming harder for young people to hear Jesus’ call — but he is still calling!” Sister Therese Marie told CNS in an email. “The desire in young people to give themselves radically out of love is still present. They just need the formation and encouragement to hear God’s call and respond with joy and trust,” she added.